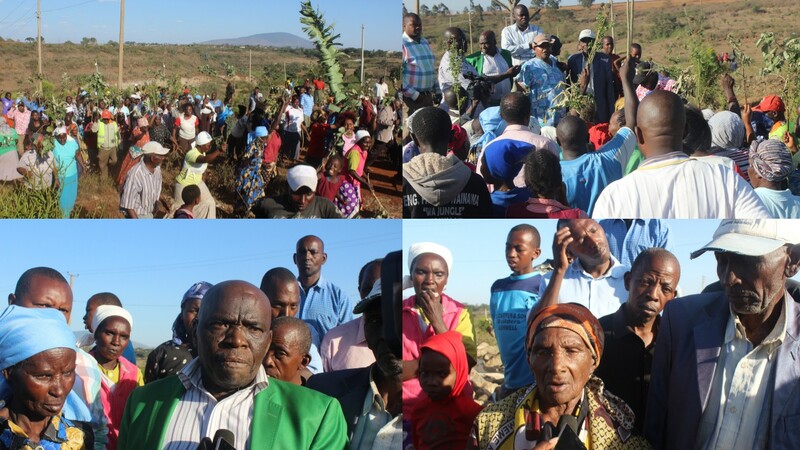 Home MTAANI NEWS Residents protest alleged grabbing of their land in Umoja, Thika. Residents protest alleged grabbing of their land in Umoja, Thika. Dozens of squatters at the disputed parcel of land Umoja Estate, Thika West Sub-County are up in arms against invasion of ‘their land’. The angry residents, who held a peaceful demonstration at the disputed land accused some senior and previous government officials of colluding with a cartel of tycoons to take over the land. They however forcefully pulled down a signboard that had been erected to warn them of dire consequences in case any of them ‘trespassed’ this property. The residents allege that the over 100 acres of land was allocated to them by the defunct Thika Municipal Council in 1996, under instructions from the then President of Kenya Daniel Arap Moi. While appealing to the National Lands Commission to intervene in the matter, the squatters feared that the situation might get out of hand and get bloody if ignored. According to their chairman Peter Njoroge Wainaina, the original size of the land amounted to 118 acres which was allocated to 600 members of Umoja Settlement Scheme. In 1999, the squatters built a primary school through the Harambee system. He clarifies that the squatters have minutes dating back from 1996 to date to prove their case. However, he says, the land was sold behind their back to a private developer in 2010 who has been terrorising them since then. “The area where the primary school stands was originally a cemetery. Unfortunately, most of its land is now in private ownership after part of it was illegally sold to quarry traders,” explained the chairman. He reckons that they had been living peacefully until January 9th 2014 when police forcefully evicted them and demolished their houses. “Families who were evicted from the land three years ago by the police spent nights in the cold until former Kiambu Governor William Kabogo settled them on some road reserve. They have continued to be harassed by the private investor who is using the police to evict them and destroy their homesteads,” he added. Efforts to salvage their land have since been fruitless as leaders have turned the settlement into a political circus to gain political mileage as well as benefit economically from their oppressors. 85 year-old Beatrice Wambui Karanja attributes the death of her husband Karanja Kabiri 3 years ago to this eviction. She says that he tripped and fell down as he was running away from the police who had come to evict them. He later died after some time, having been taken to several hospitals in vain. “I lost my husband three years ago after efforts to get him well failed. I am now living at the mercy of well-wishers and God and only appeal to the government to settle this matter once and for all,” said Wambui. Mary Njeri Ngundu now fears that they might soon suffer from communicable diseases like cholera since the area they have been temporarily settle lacks the basic sanitary facilities since it is on a road reserve. “We fear for the health of our children after our houses were demolished. We do not have anywhere to put up temporary toilets and residents are relieving themselves in the surrounding bushes,” said Mary. She adds that some of her neighbours died of depression after their personal belongings were auctioned for defaulting loan repayment. “Most of us had built our homes using money borrowed from welfare groups. After our houses were demolished, some of us were unable to repay these loans and ended up being auctioned. As a result, we have lost several of our neighbours through depression related ailments,” she says. PMG Kamau (Njuguna Wa Ruthi), the man who has been following this matter at the National Land Commission’s (NLC) offices says that the said private developer has been using fake documents to evict these squatters as there were no records at the registry to support his case. He accused him of bribing his way to erase all evidence in favour of the squatters. “I have been to the chief registrar of lands and there is no record or file to support his claim. He is simply using fake titles and the letter that he presented purporting to be from the chairman of the NLC might also be forge,” he argues. Otherwise, PMG says that if at all this document came from the NLC, he will present a memorandum to parliament seeking its dissolution as it will have failed in its mandate of protecting public property. “I will seek its (NLC) dissolution under Section 5 of the NLC Act and the Review of Grants NLC Act 2012 Section 14,” threatened PMG. Area MP Eng. Patrick Wainaina through his the Personal Assistant John Mwangi promised to follow up the case until an amicable solution was arrived at. Otherwise, he vowed not to relent as some of his constituents lived as refugees in their own country.